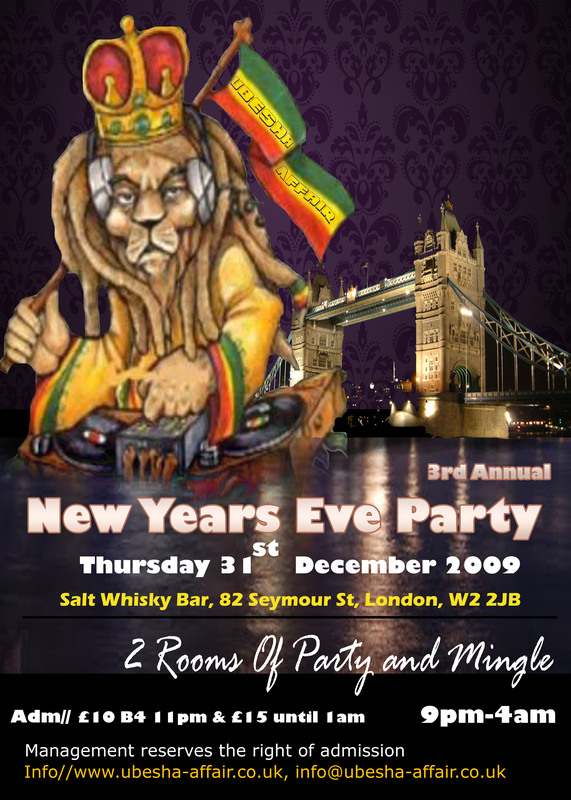 Well, If you wanna start off 2010 with a bang, head to Salt Whisky Bar on Dec 31. We have had end of month get together party in the past, although 2009 Ubesha-Affair hasn't organized as many parties as the year before, we sort of did some parties, Right? all together now YEAAA. However The scene is now set for the BIG ONE. you have to be mad to miss our end of year party. Music will be presented by DJ Kofie and Mike playing a vibrant cocktail of smooth RnB, Funky House, Club Classics, 80’s & party anthems not to forget the traditional tunes from all corners of our beloved Mama land. As a special NYE treat we have arranged a complimentary discount on most bottle drinks and completley removed the charge for mixers. The discount might not be a lot but it certainly a start and better deals will be introduced for future events. For some of you who never been to Ubesha-Affair's party, Salt Bar is perfectly located in central London just a stone throw away from Marble Arch tube. The venue consists of 2 bars, 2 dance floors.